I read Francine Prose‘s Reading like a Writer last winter on my pre-dawn morning commutes. And ever since, it has been on my list of books to share with you here on the Word Blog. That post will come soon—next week, in fact—but today’s post is about her appearance last night at the Toronto Public Library as part of The Writer’s Room. First of all, let me say that Prose’s body of work is impressively varied and that she’s prolific. I’ll be featuring her book on writing and close reading next week because this is, after all, a blog about words, but I encourage you to seek out her works of fiction, young adult fiction, children’s fiction and nonfiction, as well. 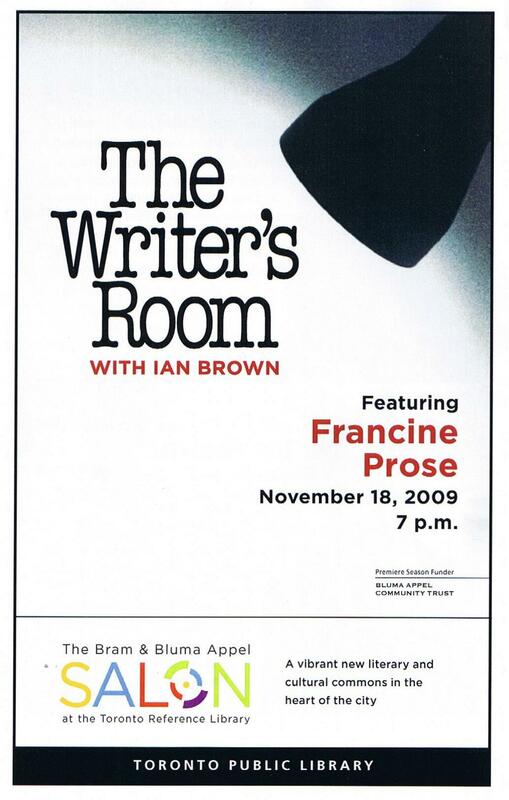 Ian Brown sat opposite Prose for last night’s interview and asked about many aspects of her work and her practice of writing. I was pleased to learn that in her classes, as in Reading Like a Writer, Prose teaches close reading of literature. She and her students ask “why this sentence, this turn of phrase, this word?” Courses that teach students to ask how these small elements affect and reflect the narrative as a whole—that ask students to slow down in their reading and really analyse the work for the multiple valences of the words within it—are rare. I had the good fortune to take a few literature courses that focused on this kind of close reading, and I’m grateful that I was taught not just how to write and argue, but how to read, as well. Prose’s most recent book, Anne Frank, considers Anne Frank’s famous diary not just as a historical document but as a work of literature in its own right. Her description last night of Frank’s beautiful writing, deftly managed cast of characters and her precocious awareness and observance of her social and political environment as a very young woman has inspired me to read the diary again. And, naturally, once I’ve done that I’ll be checking out Prose’s Anne Frank. I won’t go in to too much depth about Prose’s other titles here, except to say that she’s a New York Times bestselling author, was a finalist for the National Book Award, and has written about Caravaggio, muses, breasts, gluttony, and of course the lives of imaginary people. You’re sure to find something you’ll enjoy. You can also hear an interview with Francine Prose that aired today on CBC’s Q by following this link. http://podcast.cbc.ca/mp3/qpodcast_20091119_23327.mp3 (the interview begins at 14:40). And you’ll be able to watch a video recording of last night’s talk at the Toronto Public Library’s website soon. I’ll update this post with the link once the video is available. It was a really interesting talk. Prose is quick-witted and the small peeks into her writing practice were fascinating. (She was also kind enough to sign my book!) And if you’re interested in checking it out, I’ll be providing a link to the recorded talk here once it’s made available. How tired of me. The Writer’s Room is not a book. It’s a flavor of conference called a public interview. What I would have said, if I were in a state to operate heavy machinery, is that the interview sounds like it was interesting. And that I should follow your advice and check out Prose’s prose. Sounds like a good book. I read Reading Like a Writer a couple months ago and really enjoyed it. What an apt name, too, for a writer.